GOAL: participants will be able to develop communication skills in the English Language. TARGET AUDIENCE: a group of teenage students (14-16) from Brazil and Argentina. TECHNOLOGY EXPECTED: students will be using their own devices (cell phones, tablets or computers) to communicate in Edmodo. DEADLINE: project will be developed during four weeks. PROJECT DESCRIPTION:18 students from Brazil will be paired up with 18 students from Argentina to communicate during 4 weeks. Objective: to learn as much as they can about the other student and the place where he/she lives during this period of time. At the end of the 4 weeks, each student will write a report to the teacher expressing what they have learned. Platform: students from both countries will join an Edmodo group. Both teachers, from Brazil and Argentina, will be the managers of the group. 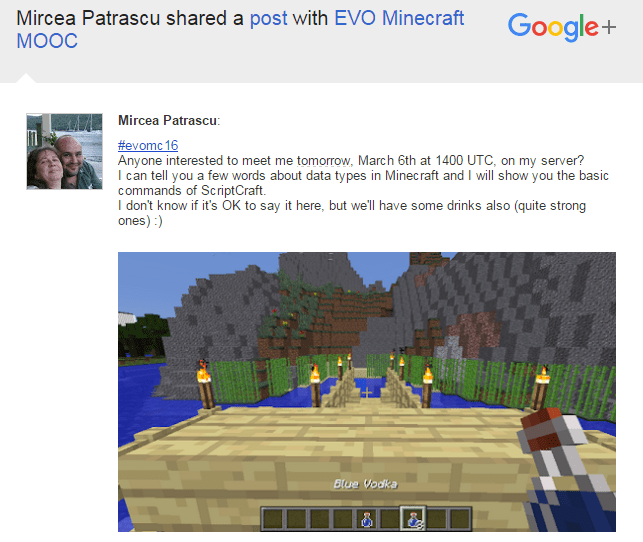 Students will be divided in small groups in Edmodo (pairs) where they can develop a conversation. Their communication can be via text, audio files, videos, photos using any kind of file they wish to attach to their messages. Teachers will have access to their communication the whole time. Teachers’ role: to get students in contact, divide them into pairs and manage their conversation. Students’ messages don’t need to be corrected by the teacher beforehand as the objective is not accuracy but the development of a conversation. However, the teacher can prepare activities to be carried out in class with some common mistakes observed (without identifying students). Final Task: by the end of 4 weeks, each student should publish a report to their teacher, explaining how the communication took place and what he/she learned about the other student. The final report should contain at least 200 words and images/ videos to illustrate it. The reports will be posted on a common wiki: http://projecthellothere.pbworks.com/ which will then be shared with parents. If space is available, up to 10 people can join us in the HoA directly at the live link posted to our various spaces at show time. Kathy Beck, is an Instructional Technology Coordinator in a large school district in North Carolina. She has a BS in Elementary Education and Psychology from the University of Pittsburgh and a MA in Educational Media and Instructional Technology from Appalachian State University. 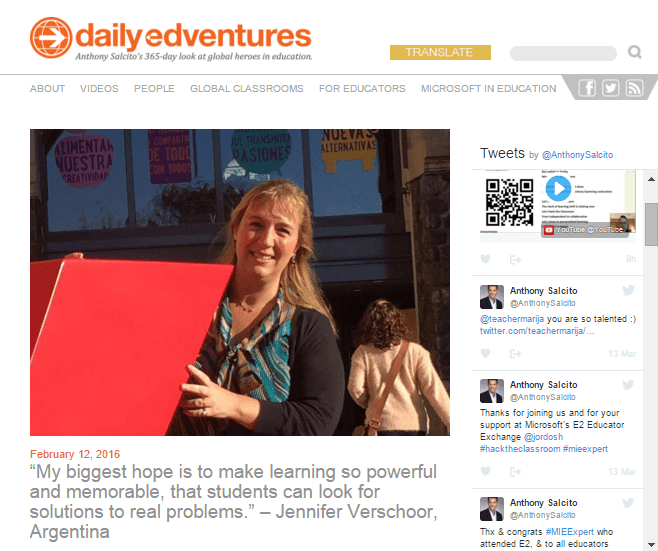 She has taught at the elementary level, in the classroom and computer lab and now serves 7 schools, training educators and working with both teachers and students collaboratively on projects integrating technology. She is passionate about the integration of technology and is a frequent enthusiastic presenter of technology tools and activities at local, state, national and virtual conferences. More information and session details are at http://live.classroom20.com. If you’re new to the Classroom 2.0 LIVE! show you might want to spend a few minutes viewing the screencast on the homepage to learn how we use Blackboard Collaborate, and navigate the site. Each show begins at 12pm Eastern (GMT-5) and may be accessed in Blackboard Collaborate directly using the following Classroom 2.0 LIVE! link athttp://tinyurl.com/cr20live. All webinars are closed captioned. On the Classroom 2.0 LIVE! site (http://live.classroom20.com) you’ll find the recordings and Livebinder from our recent ”Participate Learning” session with Brad Spirrison. Click on the Archives and Resources tab. When tweeting about Classroom 2.0 LIVE, be sure to use #liveclass20. Special thanks to our sponsors: The Learning Revolution and Blackboard Collaborate! 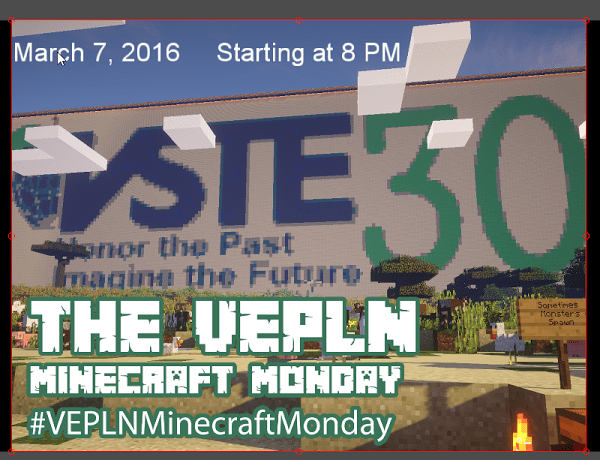 Monday, March 7th, is Minecraft Monday! We are going to have a Worldedit lesson! When you get into VSTE Place type /warp we to get to the class area. This page has links to the live view (and recording) of our meeting tonight and our voice channel in Discord. I’m excited to learn Worldedit. I need to make 12 copies of half mountains for my fourth graders to create volcano cross-sections. This is coming to me just in the nick of time! John, Mr Zwaaa, and Blake, Techplex, will help us with Discord, an app for talking while playing. Go ahead and download Discord to your computer or other device and we will help you connect to us via voice. The VSTE Place Minecraft server has been upgraded to 1.9 so go ahead and update your version so you can connect. Vance received this because he is whitelisted on the VSTE Place Minecraft server. 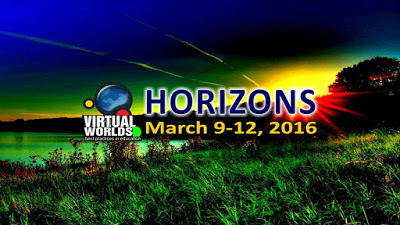 9th Annual Virtual Worlds Best Practices in Education will be held on March 9-12, 2016. This year’s theme is Horizons. 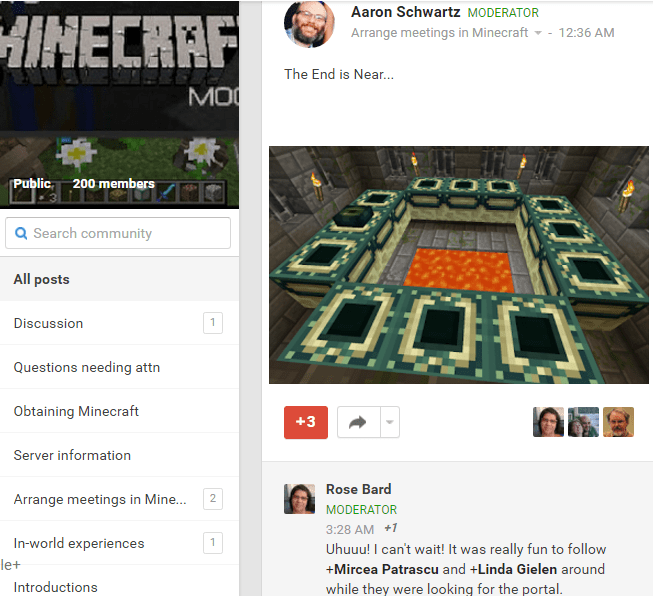 The VWBPE Conference is a completely virtual conference that is conducted using simulated environments. Participants experience the conference through a virtual reality type setting including conference rooms, theatres, exposition halls, meeting spaces, and other types of venues similar to a brick and mortar type conference. Participants walk through several real examples of the “Decision Making Process for ELL Flowchart” within the TN RTI2 Implementation Guide. Conversations move forward rather than stalemate because of the misconception of limitations. The presentation includes not only the questions that need to be asked but also specific data and evidence necessary to address each item. The meeting URL will prompt you to download the Zoom client. 18:33:14 From Rose Bard : are you recording it, Vance? 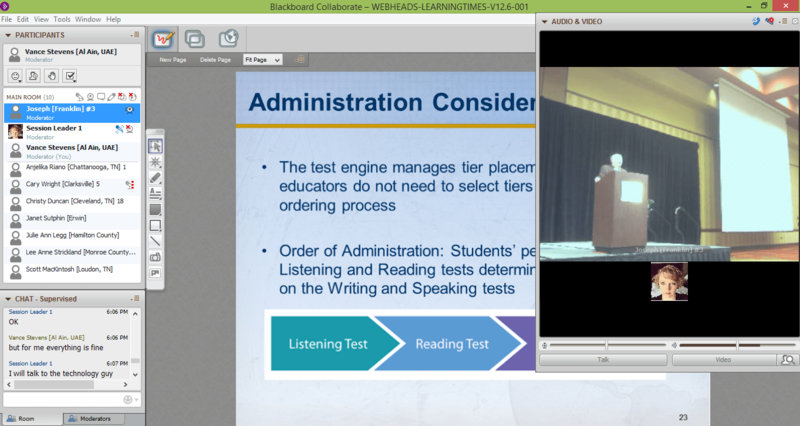 This was an open event held for volunteer webcasters at the CALL-IS EV (Electronic Village) who will be webcasting events from the annual TESOL Convention in Baltimore. Its purpose is to update and familiarize them with BbC. The announcement about Russell’s webinar contains a Google Form where you can enroll even now. Russell STANNARD is the founder of http://www.teachertrainingvideos.com. It is a website that offers free training videos that help teachers incorporate ICT into their teaching and learning. It won the Times Higher ‘Outstanding Initiative in ICT’ and the British Council ‘Technology’ award. The site receives more than 300,000 visitors a year. Russell trains teachers in ICT all over the world and also runs on-line courses which are accessed by hundreds of teachers. Russell teaches part-time at the University of Warwick and is a NILE associate trainer. 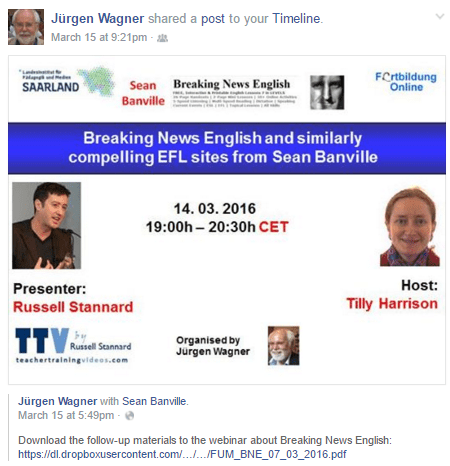 Russell STANNARD is perhaps one of the biggest users of Camtasia in education. His website http://www.teachertrainingvideos.com has hundreds of training videos and he has trained teachers in using Camtasia all over the world. This is a great opportunity to find out how Camtasia works but also to learn about some of the amazing ways the technology is being used around the world including Russell’s own pioneering work on feedback with Camtasia. This is quite simply a session not to be missed if you are involved in education in anyway! !